Welcome to the new Bitly. Today the URL shortener unveiled its major redesign with a focus on its social bookmarking features. Other updates include the ability to search for these bookmarks, beefed-up profiles, and the release of Bitly’s first iOS app (iTunes link). Unfortunately, the new design sacrifices the URL shortening experience to instead compel users to sign up. This emphasis is evident. 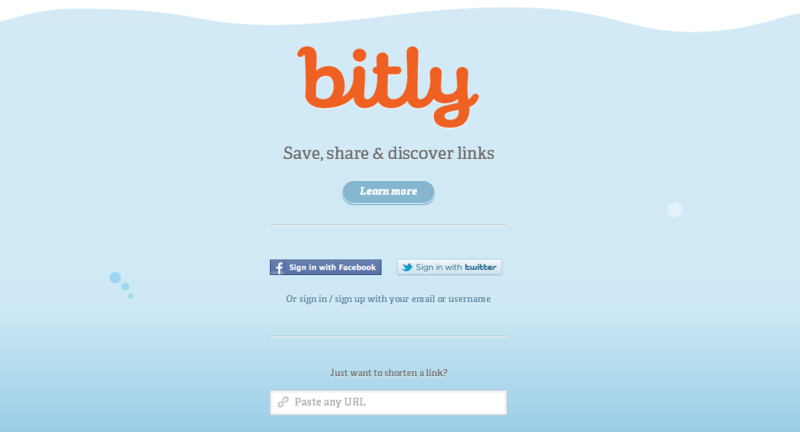 On Bitly’s landing page, you’ll notice that the URL shorting form itself has been push to the bottom of the screen. Instead, your eyes will immediately be greeted by a “Learn More” call to action, accompanied by Facebook and Twitter sign in buttons. In its blog post, Bitly lists the following redesigns and features, which focus heavily on bitmarks. • Easily save, share and discover links — they’re called bitmarks, like bookmarks. • Instantly search your saved bitmarks. • Curate groups of bitmarks into bundles and collaborate on bundles with friends. • Make any bitmark or bundle private or public. • See what friends are sharing across multiple social networks, all in one place. • Save and share links from anywhere with our new bitmarklet, Chrome extension and iPhone app. In line with social networks today, Bitly has developed a newsfeed titled “Your Network,” where users can see what Facebook or Twitter friends are bookmarking and sharing on Bitly. But what we’ve found to be particularly useful with the service is its bundling (categorization) of bitmarks and its privacy feature. This feature allows users to publicize a link or set it as private for personal use. While Bitly is betting that the new design will compel users to log in, sign up and begin bookmarking sites, its core feature – shortening URLs – is neglected for those of us who elect to sign-up and log-in. In other words, if you’re merely looking to shorten URLs we’d recommend that you remain logged out. If you’re logged into Bitly, be prepared to take a couple of extra steps to simply obtain a shortened link — namely, a user must add a bitmark by pasting in the URL, input a comment or edit the title (if desired), and then click the “Save” or “Save and Share” button, which then displays a shortened URL. Bitly has released a Chrome extension, as well as an iPhone app, thereby enabling users to access Bitly and their profiles on the go. Have you tried out the new Bitly? Let us know what you think in the comments.